UPDATE: Out of respect for the Andrew Loomis estate, Illustration Friday has removed these out-of-print books from our free collection. 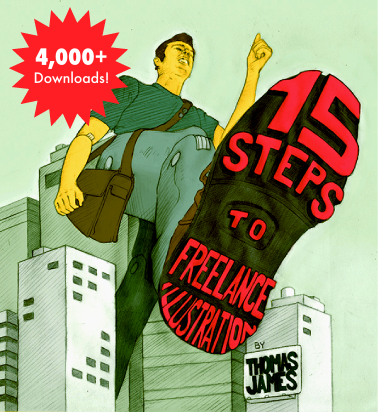 However, some of these wonderful resources are now being reprinted, so keep an eye out for the reissues, and also check out our critically-acclaimed ebook 15 Steps to Freelance Illustration. In my career I’ve been focusing on illustration for the last years, but coming from a much broader background in graphic & communication design I am fascinated with the whole book cover designing process and the challenges it comes with. Creating visuals that somehow represent a whole story without going the most obvious route or being too bold and simple is a skill that results in beautiful work when it’s mastered. Jonathan Gray aka Gray 318 clearly is one of the masters in this field. His mainly typographical works are always smart, thought-through and often show a dry wit. If you are a fan of Jonathan Safran Foer you might already be very aware of Jon’s fantastic cover work. You can see a video on youtube about the extraordinary cover design of Nineteen Eighty-Four (3rd cover shown above) here.